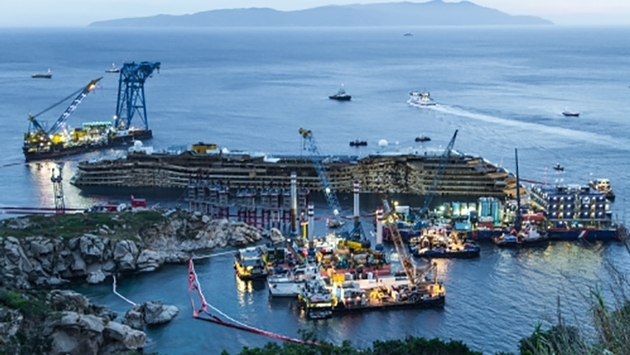 The Costa Concordia wreck is stable and will be ready for towing by late June, according to Franco Porcellacchia, coordinator of the removal project for Costa Crociere. The vessel, which was rotated upright in September, is being prepared to stay near the Italian island of Giglio for the winter. The ship sank and came to rest on its side Jan. 13, 2012, after striking a rock as it sailed near Giglio. Thirty-two people were killed and the ship’s captain, Francesco Schettino, is facing charges of abandoning ship and manslaughter. In the latest update on the salvage operation, officials said the ship has settled on the platform and seabed and is stable. Monitors active around the clock “have not indicated any significant movement.” After it is towed away, it will likely be scrapped. Costa also said that 405 safes were removed from the dry cabins on the wreck and their contents will be inventoried and returned to their owners.